50 PIECE DIE CAST CAR PLAYSETS. 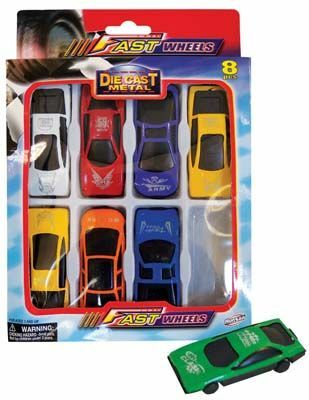 Each box contains 50 assorted metal die cast sports cars. Each window boxed. Perfect for party favors. TOY CONSTRUCTION TRUCKS. These free wheel toy trucks are perfect for play at the beach or in the sand box. Assorted styles. Sorry, no style choice available. Each netbagged with hanger.